https://sep.yimg.com/ay/yhst-33477391359232/sohal-tang-acanthurus-sohal-brown-tang-8.jpgSohal Tang - Acanthurus sohal - Brown Tang Expert Only!!! Not Cover Under Arrive GuaranteedModerate180 Gallon15.7 inchesYesHerbivore, Greens, Pellet, FlakeRed SeaAcanthuridaeSmall 1" - 3"
The Sohal Tang or Red Sea Clown Tang is from the Red Sea. Although fish from the Red Sea are generally more expensive, they are always net caught and are handled with more care, which gives them a much better survival rate. These fish are somewhat difficult to keep, but you should be able to obtain a very healthy specimen. 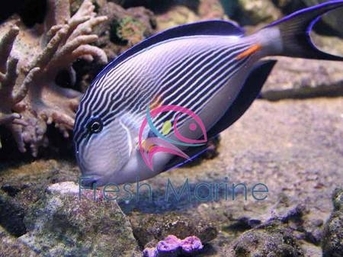 Its striking blue and white horizontal stripes has made it what many consider the 'poster fish' for the Red Sea reef environment. It is a valued aquarium fish. Like other tangs, the Sohal Tang is compressed laterally, making it extremely maneuverable and fast along the reef. It has a horozontal, blade-like spine along the base of the tail on both sides, which folds into the fish, pointing anteriorly towards the head. During defence and aggression, tangs flick the spine at other fish or intruders, causing physical harm. The surgeonfish are named for this scalpel-like spine. The Sohal Tang fish is considered a crown gem along reef tank aquarium enthusiasts. It is very hardy to disease and water quality in a fish tank, and acclimates well to captivity when it is provided at least 100 gallons of space. It lives over eight years, is a voracious eater, and is flashy in appearance. It is in strong demand and is expensive. Maximum size: The Sohal Tang grows upto 16 inches. General size: This fish generally comes in size of 5 to 10 inches. Tank Conditions: The Sohal Tang should ideally be kept in temperatures between 72 and 78 degrees Fahrenheit. A pH value of 8.1 or 8.4, and a specific gravity of 1.020 to 1.025 should be maintained. When kept with invertebrates, the specific gravity range should be 1.020 to 1.025, for the invertebrate species. In a fish only aquarium, the specific gravity should fall between 1.020 and 1.023. Habitat: The Sohal Tang range includes all reef environments in the Red Sea, up to at least 90 feet in depth. It is one of the most aggressive tangs, and combined with its large size for a tang, is a dominant fish along the Red Sea reef. Feeding and Diet: The Sohal Tang�s primary diet consists mostly of vegetable matter but occasionally includes the flesh of other animals. They have been known to nip clam mantles and munch on soft large-polyp and small-polyp stony corals.